Plastic Pens There are 81 products. 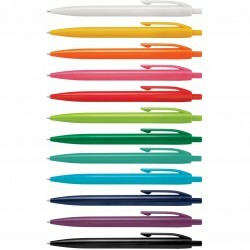 Simle and elegant retractable plastic ball pen which has a black refill with 700 metres of writing ink. It can be supplied on its own or with the Omega Notebook and has been colour matched as close as possible to the notebook covers. Affordable plastic pen for anyone on the budget. It features white barrel made of high quality ABS plastic and comes in seven different plastic grip and matching plungers to match your logo. Looking for cheap promotional pen for next give away on large scale? Spark Metallic could be pen for you. Simple and affordable pen featuring metallic silver barrel and plastic metallic trims. 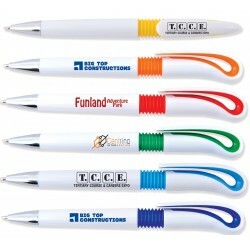 Spark pen is basic affordable pen ideal for frequent promotional give away. It features plastic silver trims and body made of ABS plastic. If you are after cheap pen this one is for you. High quality budget ballpoint pen with textured rubber grip and metal inserts.Push action pen made from high quality ABS plastic. Writing distance: 2.1 kilometres. TC roller ball. Nero pigment ink. 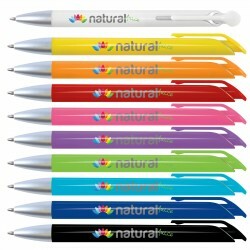 European design, plastic push action promotional pen made from high quality ABS plastic.It features uniquely designed clip with coloured inserts for better contrast.Clip is ideally suited to be branded with your logo. Simple and elegant retractable promotional pen made from high quality ABS plastic.It features matt silver tip and thin clip. Stylish silver barrel plastic ballpoint pen with coloured grip and top, with silver metal clip.Blue ink refill. Frosted plastic barrel ballpoint pen with metal clip and silver trims. Plastic, push action pen made from translucent plastic.It features translucent clip, big enough to be branded on, chrome tip and blue ink refill.Stylish and inexpensive promotional pen perfect for frequent give away. Two tone, popular European design promotional pen.Push action pen made from high quality ABS plastic.Optional black suede velvet pouch.Writing distance: 2.1 kilometres. TC roller ball. Nero pigment ink. Plastic, push action plastic pen made from high quality ABS plastic.It features translucent clip, big enough to be branded on, chrome tip and blue ink refill.Stylish and inexpensive promotional pen perfect for frequent give away.